The second year of Society’s existence, the first volume of “Glasnik” (English: The Messenger) was published. From the first issue until today 84 volumes of the “Glasnik” were published, most of them were published in double issue, with nearly 700 articles mainly from geography but also from neighboring sciences. 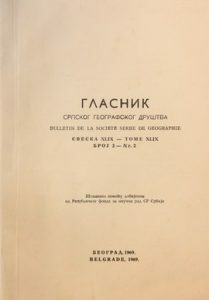 However, it is important to note that until after World War II the “Glasnik” was the only permanent scientific and geographical publications in Serbia, and that his contribution to the development of scientific geography in Serbia is invaluable.